Having trouble visualizing that finished project? 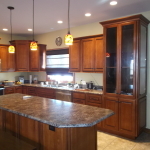 New construction or Remodeling - Our cabinetry layout and design is the way to go. Our accuracy and details make it easy for the homeowner to get that visual that is so important before construction begins.